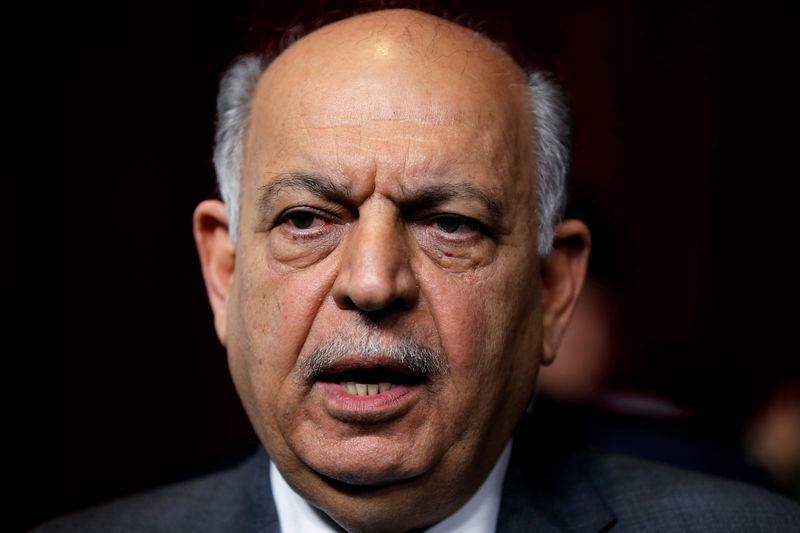 BAGHDAD (Reuters) - Iraq plans to increase its oil output and export capacity in 2019, with a focus on its southern oilfields, and is close to reaching a deal with international companies, Oil Minister Thamer Ghadhban said on Tuesday. The new minister also said the shortfall in oil supply caused by new U.S. sanctions on Iran had yet to be gauged before Iraq and other OPEC members could decide what action to take ahead of their policy meeting next month. Iraq, OPEC's second-largest producer, is targeting production capacity of 5 million barrels per day (bpd) in 2019, with average exports expected to reach around 3.8 million bpd. Iraq currently pumps around 4.6 million bpd, second only to Saudi Arabia in the Organization of the Petroleum Exporting Countries. The bulk of Iraq's oil is exported via its southern terminals, which account for more than 95 percent of state revenue. Upgrading capacity, especially in the south, "is a top priority," Ghadhban told Reuters in his first interview since taking over at the ministry last month. "We have had talks with international companies which lasted for a while, but now we are about to reach a deal and will settle this issue soon," he said. In the coming years, Iraq plans to boost export capacity to 8.5 million bpd after upgrading its infrastructure, Ghadhban said. This would include 6.5 million bpd from southern oilfields, with 1 million bpd to become available after a new pipeline from the northern city of Kirkuk to Turkey's Ceyhan port on the Mediterranean is built. Ghadhban, who replaced Jabar al-Luaibi as minister, is also looking to diversify Iraq's export outlets through new pipelines. One of Iraq's immediate challenges will be to gauge the shortfall in global oil supply caused by sanctions Washington reimposed on Iran's oil sector on Monday. Ghadhban said Iraq wanted to see the "actual decrease" before Baghdad and other OPEC members decide how to deal with a reduction in Iranian shipments. "What will be the physical increase in demand on Iraqi oil ... if there's no demand, how can I say we'll compensate?" Ghadhban did not specify what oil price he expected for 2019. He said a price above $70 per barrel was "fair" and that the higher the price, the better it was for Iraq. "I compare it with previous prices ... when we talk about prices above 70 ... I say it's a fair price, it’s not 30 or 50 and it’s not 100. "In principle, the higher the price, the better for Iraq. But we're not working alone .. we're a member of OPEC. We see the interests of consumers and we want to be a viable producer and exporter," Ghadhban said. Washington's sanctions target Iran’s oil, banking and transport sectors and it has threatened more action to stop what it calls "outlaw" policies - steps that Tehran called economic warfare and vowed to defy. A U.S. official confirmed Iraq had been granted a waiver to import some Iranian products. Iraqi officials said last week Baghdad would still be allowed to import crucial gas and energy supplies for its power stations as well as food items. In a tumultuous region, Iraq hopes to have more avenues for export. The Oil Ministry received bids from three foreign contractors to build a giant water treatment facility vital for the OPEC member to grow its oil production capacity, Ghadhban said. He said he expected work to begin in early 2019 and that the cost of the project was several billion dollars. An additional 1 million bpd of export capacity would be added from a pipeline that eventually connects the southern city of Basra with Jordan's Red Sea port of Aqaba, he said, adding that building new pipelines aims to "diversify our export outlets". A final deal is expected to be reached with energy company BP to boost output from oilfields around Kirkuk, Ghadhban said. "I have met their representative (BP) yesterday and I hope very soon we reach an arrangement ... it's one of the priorities," he said.